Homepage. This page: Grey Courier Van photograph. Super-dooper rare one here - the Herald based Courier van. They didn't really take off and were only made for a few years in the early 1960s. Good ones are quite sought after due to their rarity. This 1964 registered example looks fab. Triumph Books Whether for the Courier Van as shown below, or any other type of Triumph, it is worth having a look on Amazon for books, DVDs, Videos etc. 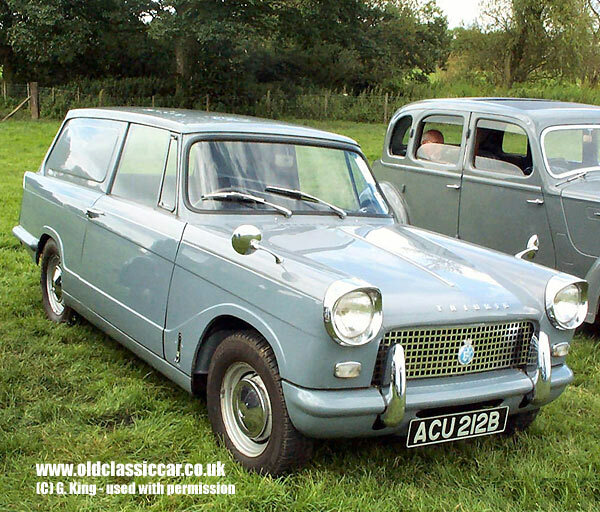 Have you seen today's eBay auction listings for the Triumph Courier Van? Photographs of classic Triumphs, Courier Vans and other old motors. The Triumph photograph above wasn't taken by me, but by G. King, and is shown on oldclassiccar with his permission. His photos were taken at various locations a few years ago, including photos of classic Triumphs such as the Courier Van shown above. From what I can tell, some of the cars and vans featured were seen at shows (eg at the NEC and Alexandra Palace in London), whereas others were spotted out and about in daily use, or parked up at the side of the road. If you own the Triumph shown here, or know the story of this particular Courier Van, by all means get in touch. I'd be interested in showing similar photos of other Courier Vans too, so if you can help please drop me a line. More of the photos in this particular collection can be seen on the general Classic Car Photographs page. Other picture collections, featuring similar Triumphs, are available to view in the main car photos section.